So... is it normal to get a second set of LRM pods with the Madcat miniature? I counted, both have 20 missile tips, but the extra are a bit bigger... They also have a tiny recess (hole) on the bottom like they fit on a stub, but I would have to cut off the original pods to use these. A Mad Cat, honey, is what happens when a Marauder and Catapult love each other very much. The base Mad Cat mini has separate arms and LRM packs. The LRMs attach to the top of the arm by a peg on the arm going into that hole in the LRM. I think the Pryde has the extra LRMs simply because they are on the same sprue as the other torso bits. Not sure why the arm/LRM assembly got changed in the conversion to the Pryde config though. Thanks, that makes sense. 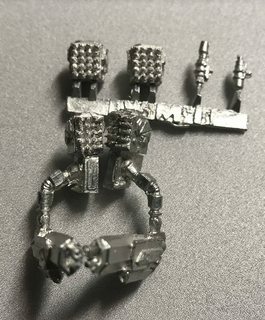 The LRM's that are pre-attached are not as nice (or big) as the other on the sprue - thinking of swapping them out, but thats a bigger cut that I have done in a long long time. Any recommendations on separating the existing LRM pods from the arms? Jewler’s saw or a Dremel would be good. You can do it with an Exacto knife, but it wouldn’t be my first choice. That's actually a relatively small cut. You can do it with an exacto knife... just be careful. I'd put it on a block of wood for support, inside down, then rock the blade across the cut-line while applying a decent amount of pressure. Ideally though, a razor saw or jeweler's saw. So no progress (yet) because I am waiting to get to Harbor Freight tomorrow to pick up some bits and look for jewelers saw or something to help with this build. Also, if I'm being honest, this is a bit intimidating, lol! I DO want to paint this to correct scheme - where can I find Aidan Pryde's correct look? I can't find it on CSO otherwise yet. This will become a display piece for my son Aidan Pryde R. when he is old enough to learn to play. Only 3 now, so I have a few years to get this right. The cover of Falcon Guard can't be too far off. 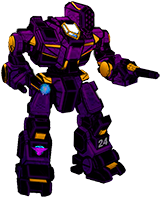 As of FM:Crusader Clans, the Falcon Guard is part of Gamma Galaxy. I don't think that changed between c.3050 and 3059, but someone can correct me if it did. I can help with that actually. 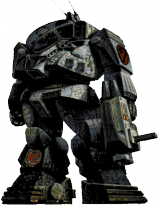 The Pryde setup has the LRMs and arms fused as one piece rather than separate because they're joined on the jump jets that are unique to his configuration (the MGs and MPL are left off in favor of the jets). If you look at the back of the piece you'll see the jump jet ports.in the 'armpit' (so to speak) of the part. So, hey, you have a couple of spare LRM bits for a future project now. Note that as I said, Pryde removed most of the extraneous torso weapons to add those jets, so you only need the ER small laser (OF DOOM), not both parts. Per his config it should be CT mounted if I recall, but that's a pain so I'd put it as-normal and just claim the cockpit section is the center torso. I'm lazy.